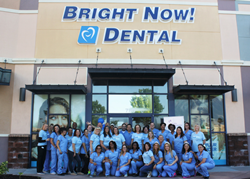 In Partnership with the Smiles for Everyone Foundation, Bright Now!® Dental will provide free dental services for low-income, underinsured individuals at its Mesa, Arizona office on April 14th. Bright Now! ® Dental provides general dentistry, children’s dentistry and, in select locations, specialty care services such as orthodontics, oral surgery, periodontics and endodontics at over 150 offices across Arizona, California, Colorado, Florida, Indiana, Maryland, Ohio, Oregon, Pennsylvania, Utah, Virginia and Washington. Bright Now! Dental’s Mesa office is operated by Modern Dental Professionals - Arizona, Inc., P.C. (the “Group”). The Group is affiliated with Smile Brands Inc., one of the largest providers of business support services to dental groups in the United States. Smile Brands Inc. provides comprehensive business support services through exclusive long-term service agreements with affiliated dental groups, so dentists can spend more time caring for their patients and less time on the administrative, marketing and financial aspects of operating a dental practice. Smile Brands is a portfolio company of Gryphon Investors (“Gryphon”), a leading middle-market private equity firm based in San Francisco, CA. For more information, visit http://www.smilebrands.com.